This post is part of a series that highlights Independence, Texas, the home of Baylor University from 1845 to 1886. One of the many historic preservation groups that has assisted with preserving history in and around Independence through the years was the Baylor Historical Society. Formed to “stimulate interest in the history of Baylor University,” the society was founded in February 1941. Membership was open to anyone interested, and it cost only $1 to join the society. Members attended regular meetings on the Baylor campus, and usually heard a historical paper presentation at each meeting. Featured speakers included such state luminaries as Price Daniel (governor of Texas 1956-1962) and Pat Neff (governor of Texas 1921-1925, president of Baylor University 1932-1947). Longtime Baylor staff and faculty members P.D. Browne, Robert L. Reid, and Lily Russell served as society officers, and many descendants of early Baylor-associated families were members of the organization. Celebrating the first restoration of the iconic columns at Independence. Pictured are (left to right): Dr. Gordon Singleton, President of the University of Mary Hardin-Baylor, Judge Royston Crane, son of former Baylor president William Carey Crane,, Dr. W. R. White, President of Baylor University, Judge E. E. Townes, Vice President of the Baylor Board of Trustees (Board of Regents). The society was very interested in preserving Texas, Baylor, and community history at Independence. 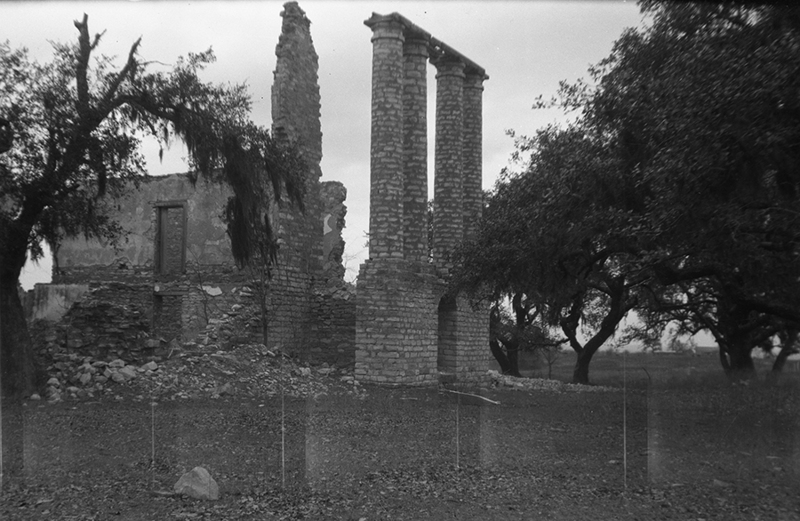 Members raised money to stabilize the iconic Baylor columns, discussed a plan to reconstruct a dorm and operate it as an inn, and lobbied the Texas Legislature to turn part of Independence into a state park. Members also helped the Texas State Garden Club landscape around Independence. It is not known exactly when the society disbanded. By 1964, the society only had 21 members at their annual meeting, and many of the people who had taken the lead in forming and running the organization had passed away. Longtime member P.D. Browne donated the society’s records to the Texas Collection in 1975. Works Cited: BU Records: Baylor Historical Society, Accession #BU/28, The Texas Collection, Baylor University, and BU Records: Historical Research Office, Accession #BU/103, The Texas Collection, Baylor University. 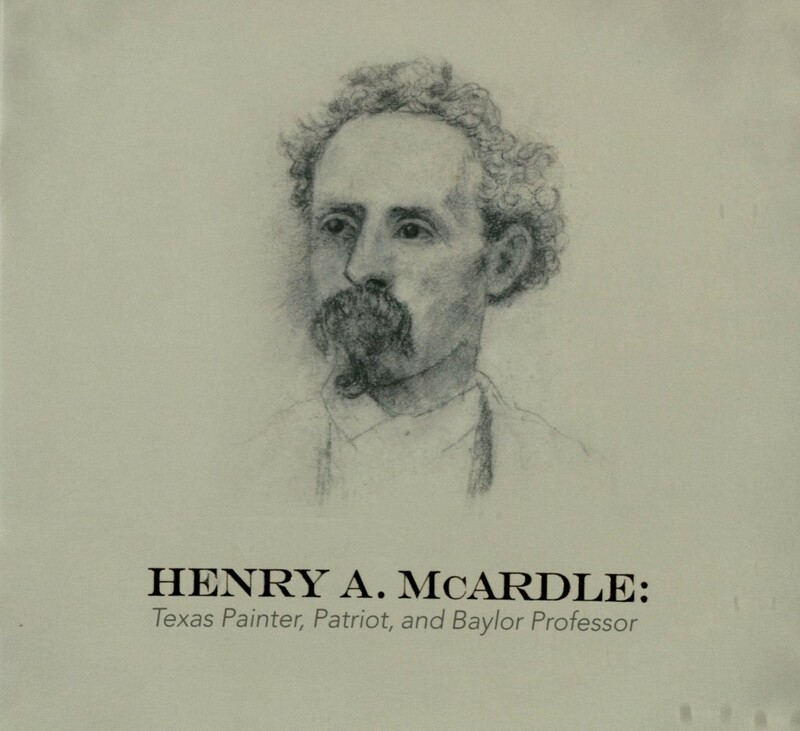 Twenty-two paintings by Henry A. McArdle, painter and Baylor professor, are on display at the Martin Museum of Art. McArdle served Baylor at Independence as the director of the school of art. These paintings have never been shown together and include three paintings from the Texas Capitol as well as from private collections. Opening events include a roundtable discussion with exhibition lenders (including our own John Wilson, representing The Texas Collection) on Saturday, August 30, at 3:00 pm, followed by a reception with light refreshments at 4:30 p.m. These events will be held in Hooper-Schaefer Fine Arts Building and are open to the public. 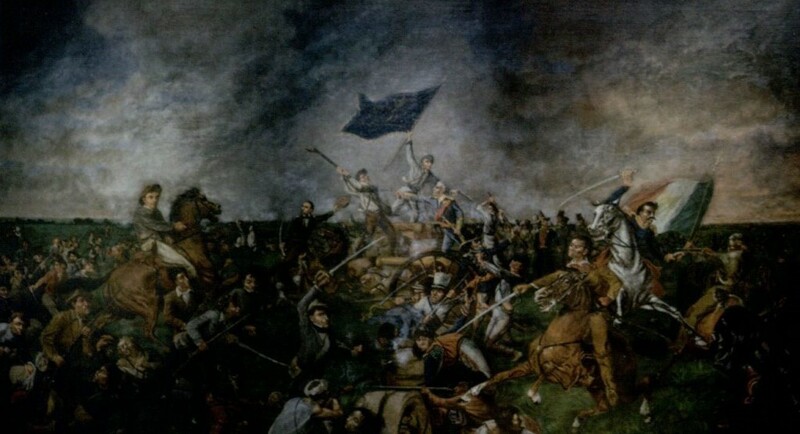 Battle of San Jacinto, by Henry A. McArdle. Private collection, Midland, Texas. Read more in the Waco Tribune-Herald’s great piece on the exhibit. Texas has changed quite a bit over the years, as is readily seen in our vast photograph collection. To help bring some of those changes to life, we’ve created a “Texas over Time” series of GIFs that will illustrate the construction and renovations of buildings, changing aerial views, and more. Our collections are especially strong on Waco and Baylor images, but look for some views beyond the Heart of Texas, too. The Baylor Female Building was built for Baylor University in 1857 by contractor John P. Collins and was three stories tall, with features including classrooms, an auditorium, a library, and recreation rooms. After Baylor Female College left, the building continued to be used as an academic building by the now defunct William Carey Crane Male and Female Colleges until the schools were renamed Binford University, and eventually closed altogether in 1897. In the early half of the twentieth century, the neglected building became victim to a fire which gutted the building and hastened its demise. Soon, all that remained were the columns we see today (which have been restored a few times). Starting in 2001, the columns were made a part of Baylor’s Line Camp experience, where incoming students are taken to the site and walk under the arch of the columns, thus symbolically joining the Baylor Line. Baylor at Independence is now jointly overseen by Baylor University and the University of Mary Hardin-Baylor. See our Flickr set on Baylor at Independence for these and other images of the old building on Academy Hill. Murray, Lois Smith. Baylor at Independence. Waco, Tex. : Baylor University Press, 1972. Print. Dunn, Betty L. 1889: Baylor Campus at Independence Becomes a ‘Colored’ Catholic Orphanage & School. 2014. Print. White, Michael A. History of Baylor University, 1845-1861. Waco, Tex. : Texian Press, 1968. Print. “A Visit to Independence.” Baylor Magazine, Summer 2011: Vol. 9 Issue 4. Web. Hosea Garrett painting, undated. This painting is part of our Fine Arts collection. One of the most important early supporters of Baylor University is also one of the lesser-known figures in university history. He has no building named in his memory, and his story is given only brief attention in resources about early Texas and Baylor history. Despite the lack of attention, Baptist minister and wealthy landowner Hosea Garrett was one of the longest-serving trustees in Baylor history and was a major donor of both his time and resources for more than 40 years. Not much is known of Garrett’s early years. Born in South Carolina in 1800, he married his first cousin Mary Garrett in 1819 and was ordained as a Baptist minister around 1835. The Garrett family came to Texas in 1841, and settled in Chappell Hill, Washington County. Over time, Hosea Garrett became one of the richest plantation owners in Washington County. Almost immediately upon arriving in Texas, Garrett began doing what he could to encourage Baptist churches throughout Texas. Although he spent the bulk of his time preaching in Washington County, Garrett was also involved on the state level with Baptist churches. 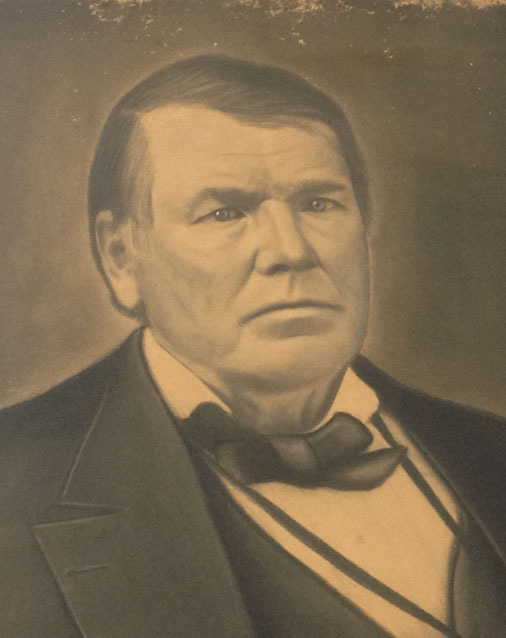 Just prior to the American Civil War, he became president of the Baptist General Convention of Texas. Garrett must have become involved with Baylor University shortly upon arriving in Texas. His home of Chappell Hill (about 20 miles southeast of Independence) was one of a few towns that submitted bids for Baylor to make its home there—perhaps he was involved with that town’s offer. Garrett was first elected to the Board of Trustees (today the Board of Regents) in 1848, became president of the board that same year, and gave generously of his administrative talents while serving until 1868. But his service was not yet done—in 1870 he became president of the board again, serving until 1888. A notable change in the university during his tenure was the move from Independence to Waco in 1886, which he helped to oversee. His combined 38 years as president of the board still ranks as the record for the longest-serving leader of the board. 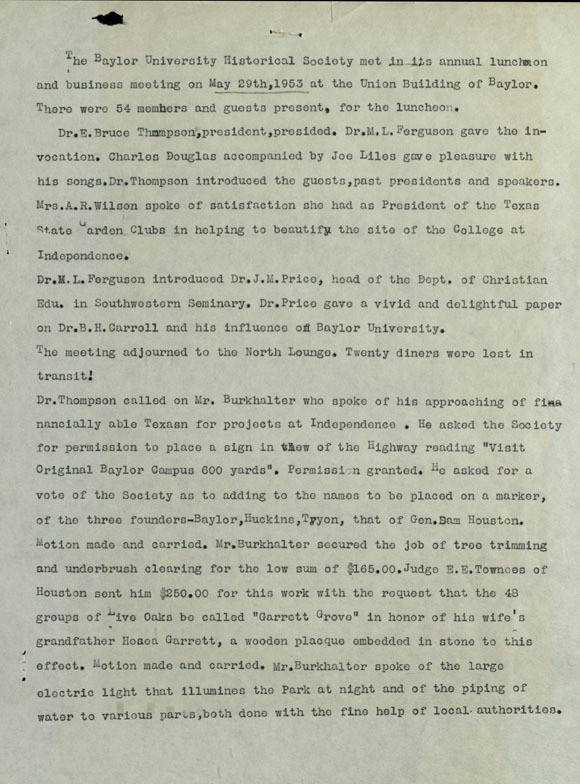 Page from the minutes of the Baylor Historical Society, 1953. Mentioned at the bottom is the oak grove memorial to Hosea Garrett. 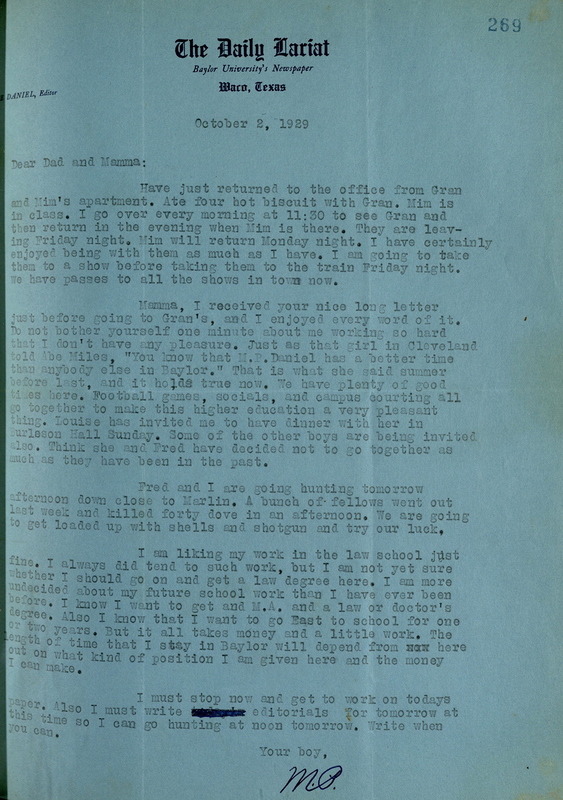 BU Records: Baylor Historical Society BU/28, box 19, folder 7. Hosea Garrett passed away in 1888, at his home in Chappell Hill. However, that is not the end of his story. In the 1950s, when Baylor supporters were active in securing the original site of the university in Independence, Texas, descendants of Garrett named an oak grove on the property in his memory. The exact location of the grove is now lost to history—there are many oaks in Independence! However, the oak tree is known for its strength and endurance, and surely some of the descendants of that grove survive as a fitting memorial to a man who helped establish a firm foundation for Baylor University. 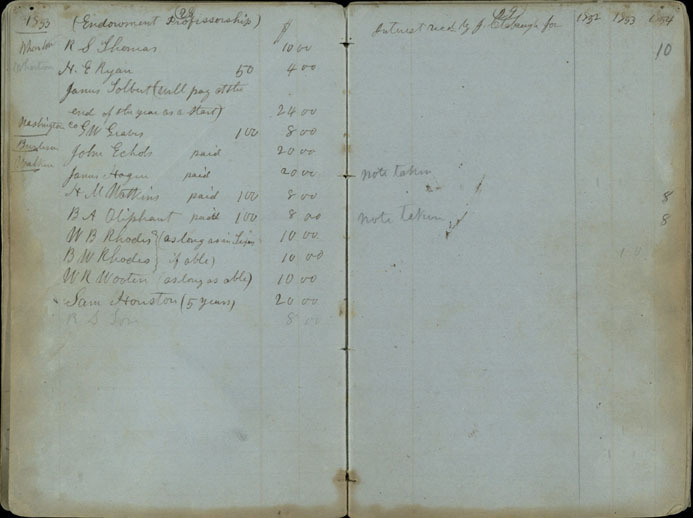 Did you find Sam Houston’s donation of $20 to Baylor in the subscription book? That $20 in 1853 would be about $550 today, according to inflation calculators. 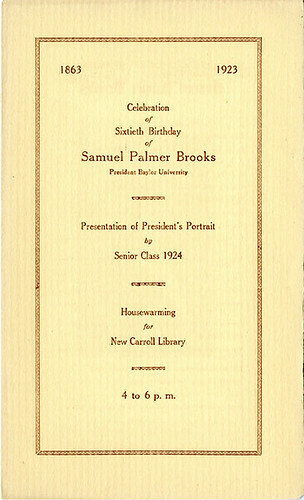 Housewarming program for newly reconstructed F. L. Carroll Chapel and Library, 1923 December. Having been destroyed by fire, the building (sans chapel) reopened to the public during the celebration of President Samuel Palmer Brooks’s sixtieth birthday. BU Records: Alumni Rebuilding Campaign #BU/58, box 2, folder 12. BU Records: Alumni Rebuilding Campaign, 1922-1923: The records of the Alumni Rebuilding Campaign consist of correspondence, financial documents, and administrative records regarding fundraising efforts to rebuild Baylor’s F. L. Carroll Chapel and Library after the building was destroyed by fire in 1922. 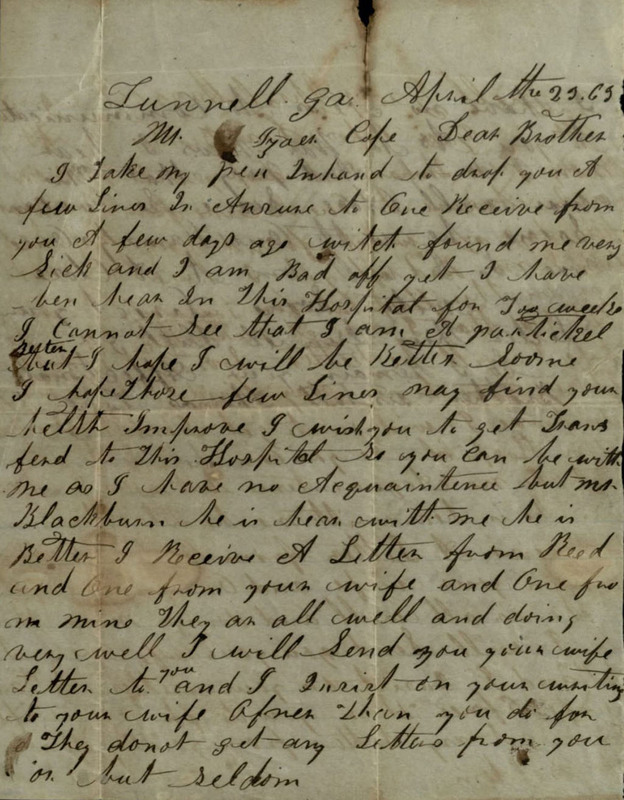 Hosea Garrett papers, 1856-1878: The Garrett papers contain correspondence and financial documents primarily produced by Hosea Garrett during 1856-1863. Garrett was a trustee of Baylor University at Independence and a major donor throughout the early years of Baylor. 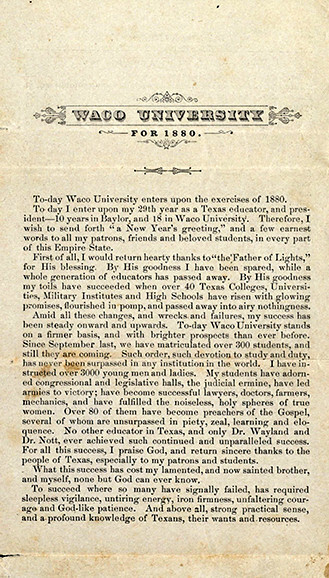 State of Baylor University report by President George Baines, 1862. 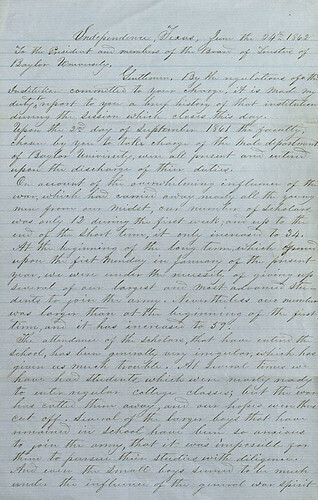 The report to the Board of Trustees documents the difficulties of leading the university during the American Civil War, with students and professors leaving all the time and tuition bills not being paid. 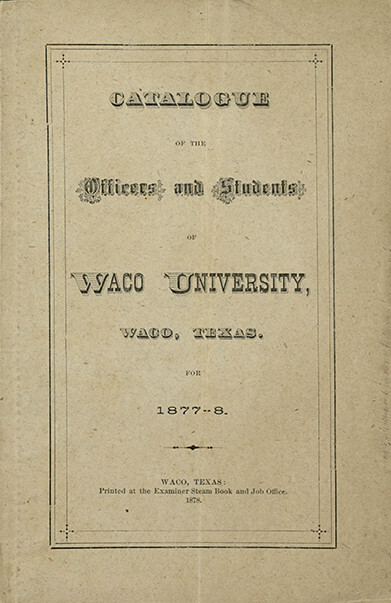 Pamphlets like this were written by Rufus C. Burleson to inform interested parties about developments at Waco University and appeal for support. Waco University collection #169, box 1, folder 6. Baylor University’s Waco roots are tied to the somewhat short lived Waco University. Originally founded as an all-male high school in 1857, the institution eventually came under the control of the Waco Baptist Association, which gave it the name Waco Classical School. In the 1860s, amid internal administrative issues, school management decided to seek new leadership to take the school in a new direction. The trustees offered then current Baylor University President, Rufus C. Burleson, control of the institution. Burleson, who at the time was clashing with faculty in Independence, accepted the offer from the Waco Classical School. He resigned from Baylor in the spring of 1861 and moved to Waco, taking with him many Baylor professors and students. Annual catalogs created by Waco University not only listed that year’s course offerings, but also described the guidelines and culture of the university. Waco University collection #169, box 1, folder 3. With Burleson as President, the Waco Classical School was transformed into Waco University over the summer of 1861. The University officially opened as an all-male institution on September 2 of the same year. The venture was moderately successful, but the momentum of the Civil War took a toll on the development of the fledgling university. Although it remained open throughout the war, Waco University faced budget shortfalls and periods of low enrollment. After the war, the University began to flourish with increased matriculation and an expanded curriculum. The creation of the female department in 1866 made Waco University among the first coeducational universities in the United States. Although men and women attended the same university and were taught by the same professors, gender segregation was not uncommon. 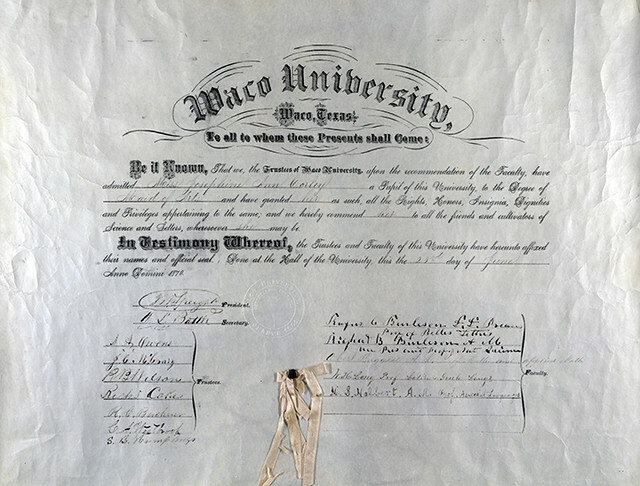 An example of Waco University’s gender sensitivity is found on Josephine Ann Corley’s 1870 diploma. At the time, women were awarded “Maid of Arts” degrees, whereas men were awarded “Bachelor of Arts” degrees. Waco University collection #169, box 4, folder 1. As Waco University matured, it began to compete with Baylor for potential students. This complication was further compounded by the fact that two different Baptist organizations supported the universities. Both universities existed alongside each other for a number of years. The arrival of train service to Waco would be the beginning of the end for Baylor in Independence. Without a major source of transportation, Baylor began to decline. Later in 1885, the two Baptist organizations that supported the universities joined together and decided to support only one university. It was decided that the organization would consolidate both universities to form Baylor University at Waco. Waco University’s Board of Trustees held their final meetings in 1887 to transfer all assets to Baylor. 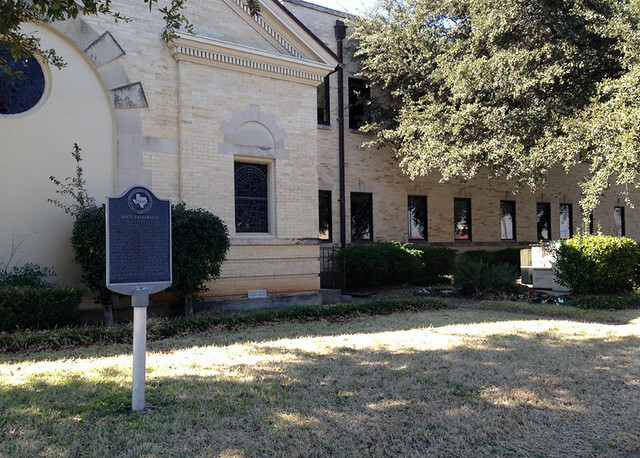 The 500 block of South Fifth Street is the approximate area where some of the Waco University buildings were located. First Baptist Church of Waco now occupies this site. Waco University ceased operations at the end of the spring 1886 term. Baylor University at Waco was not much of a change for students of the defunct university. The same curriculum, faculty, facilities, and polices were retained for the first few years. That would soon end as Baylor gradually shifted away from what was established at Waco University. Baylor began to build new buildings to the south and altered the curriculum. After the completion of buildings on the new campus, the remaining Waco University structure became the Maggie Houston Hall dormitory before eventually being phased out. Waco University was Baylor’s entry to Waco, but it is more than just a footnote in Baylor’s history. Visit the Texas Collection to view the Waco University collection and see its digitized catalogs to explore this institution’s own rich history. Baker, Eugene W. To Light the Ways of Time: An Illustrated History of Baylor University, 1845-1986. Waco: Baylor University, 1987. Bragg, Jefferson Davis. “Waco University.” The Southwestern Historical Quarterly 51, no. 3 (January 1948): 213-224. Guemple, John Robert. “A History of Waco University.” Master’s thesis, Baylor University, 1964. “Waco University.” Handbook of Waco and McLennan County, Texas. Ed. Dayton Kelley. Waco: Texian Press, 1972.